The dramatic sequel to Sekret, this psychic Cold War espionage thriller follows Yulia to Washington, DC, where she fights to discover the truth about her family without losing control of her mind. My mind is mine alone. Life in Washington, D.C., is not the safe haven Yulia hoped for when she risked everything to flee communist Russia. Her father is reckless and aloof, and Valentin is distant and haunted by his past. Her mother is being targeted by the CIA and the US government is suspicious of Yulia's allegiance. And when super-psychics start turning up in the US capitol, it seems that even Rostov is still a threat. 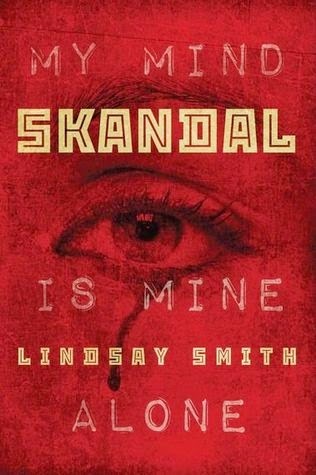 Ultimately, Yulia must keep control of her own mind to save the people she loves and avoid an international Skandal. SKANDAL is the conclusion to the Sekret duology. The story takes place 3 months after 17-year old Yulia Andreevna Chernina and her boyfriend Valentin escaped from the USSR where they were used as tools by the KGB in hunting down traitors and spies. After requesting asylum in the US, there is a whole new world for Yulia to learn about. Especially the English language and culture so that she can fit in. Thankfully, Air Force Sergeant Winnie Davis is her teacher in all things American. My past cannot hurt me now. My future cannot stop me now. All I have is now. Yulia has difficult time understanding her purpose, except when she is recruited to join the CIA's PsyOps Team where she works alongside her father Andrei, and Valya. Yulia is focused on several things that are important to her. Finding her mother Antonina who may or may not be working with General Rostov, and reuniting with her brother Zhenya. Lastly, stopping General Rostov who has also taken his game to a whole new level and is trying to push the US into war. This is a story where you really have no clue if someone is loyal, or a mole for the Soviets. It is a world where one wrong step by either the US or USSR, can lead to severe implications for the entire world. I liked that Yulia has taken charge of her own fate but still struggles to understand her powerful abilities. She no longer chooses to let anyone in her head without her permission. Her mind is her own, but she still faces struggles dealing with powerful psychics called scrubbers sent by Rostov to cause mayhem. She struggles with the language barrier, and that is something that is authentic, and not faked for entertainment purposes. Her relationship with her father is just brutal, while her love for Valya is pretty unwavering, as is her desire to help rid him of past unwanted memories that continue to haunt him. You really can tell that Lindsay Smith did her due diligence when it came to researching the setting of this story. I love that there is a deep historical aspect to this series including showing how Winnie struggles as a black female during a time when the Civil Rights movement was trying to overcome political stalling. The use of psychics to fight a war against your enemy, is pretty damn scary. But, when you think about everything that's come out into the open since then about what took place during the Cold War, it isn't even close to being the worst things this country, or Russia has done. SKANDAL takes place in 1964. I was 2 years old at the time. Yes, I am that old! We had just survived the Cuban Missile Crisis the previous October (1963), and our President, John F. Kennedy was assassinated (November 22, 1963). Stanley Kubrick’s dark comedy, Dr. Strangelove or: How I Learned to Stop Worrying and Love the Bomb premiered. The film satirizes Cold War politics, playing upon American anxieties and changing attitudes towards nuclear warfare. Martin Luther King Jr was standing up for Civil Rights, which later passed under President Johnson & a Republican Congress as the Civil Rights Act of 1964. Thanks to North Vietnam attacking one of our ships, U.S. Involvement in the Vietnam War ratcheted up and didn't end until 1973. Before you ask why you should care, there is an old adage of history repeating itself. You also have to understand that the War on Poverty that began more than 50 years ago, still hasn't succeeded in what it was intended to do. Help the black community get out of poverty, and have a chance that white's have had since the US freed the Slaves. In the end, SKANDAL was a bit on the foreshadowing side and not action packed as I would have preferred it. I would have liked to see more resolution between Yulia and Sergei who is almost as scary as Rostov. I would have preferred a bit different outcome with Yulia's mom. In a way, it was almost expected. In another way, it broke my heart. Still, due to the historical aspects, and the realism of the characters and settings, I'm giving the story a A-/B+. the history used sounds so well done like that, I love that in fact the period is different too. Plus it's always so great to have a good end to a series like that. Thanks for sharing! I'm starting Sekret, probably, next week. I hope that I love it enough to read this one. I'm all for history bending reads! Nice! Hope you have fun! I didn't realize this series was set in the 1960s. I am intrigued. I read the first book and while it should have been perfect for me it just didn't pull me in like I would have liked and I decided not to finish the series. It's kind of sad because it has so much stuff that I love. And the time period is excellent! I'm glad you enjoyed! Let me know if you do. Would love to read your thoughts! I love this type of Historical fiction. When you somehow learn something about the world at a certain point in time. I really should check these out. Whoa, we're the same age group then. Very cool! I love when you can tell an author has actually done their homework. These books sound really good. And it's only a duology. lol @ Loupe's comment. That's how I felt when my son's friend referred to the 80's as oldies music. Yeah, the 80's music gets a seriously bad rap. Poor kids don't know what they're missing! I didn't realize this had a paranormal aspect to it. I tend to like action though so I think I'd agree with you. The experiencing US culture from the outside part could be fun. Absolutely! I hope you get a chance to read this series!